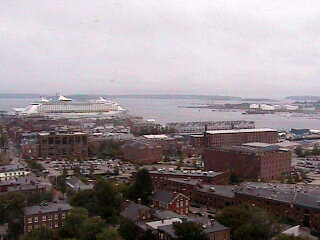 Look out over Portland Harbor with our new web cam at the Holiday Inn by the Bay. View it on our site here: Inn by the Bay Web Cam, or visit their site here: Inn by the Bay – The View. The camera is fully controllable and offers you a real-time view of Portland harbor and everything going on there… check out the cruise ship docking in the harbor today (word is they arrived early to get away from Hurricane Earl).